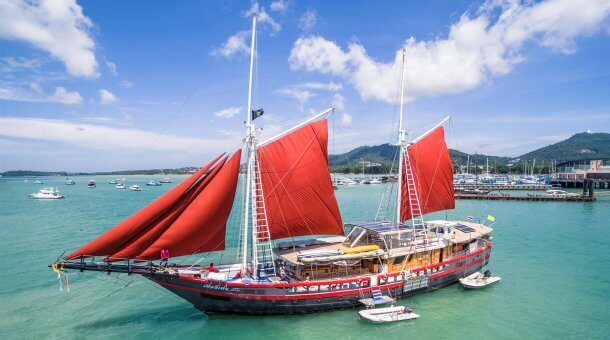 MV Andaman Tritan operates trips in the Similan islands and Richelieu Rock, and is a comfortable and very reasonably priced wooden hulled liveaboard boat launched in October 2002 and totally refurbished in 2014. She is 24.5m long and 5.5m wide. 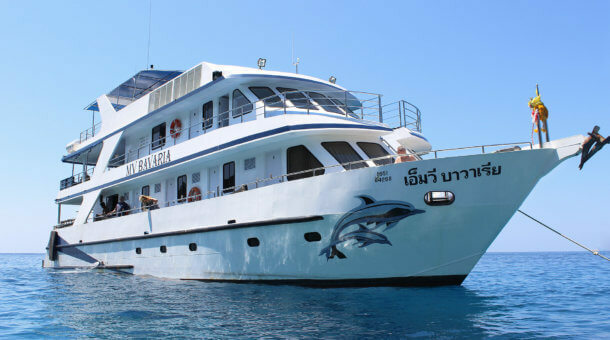 Designed from the start with the customers comfort, safety and enjoyment in mind, she has air-conditioned guest cabins for a maximum of 16 divers, an indoor saloon as well as an outdoor dining area and a spacious sun deck for relaxing between dives. 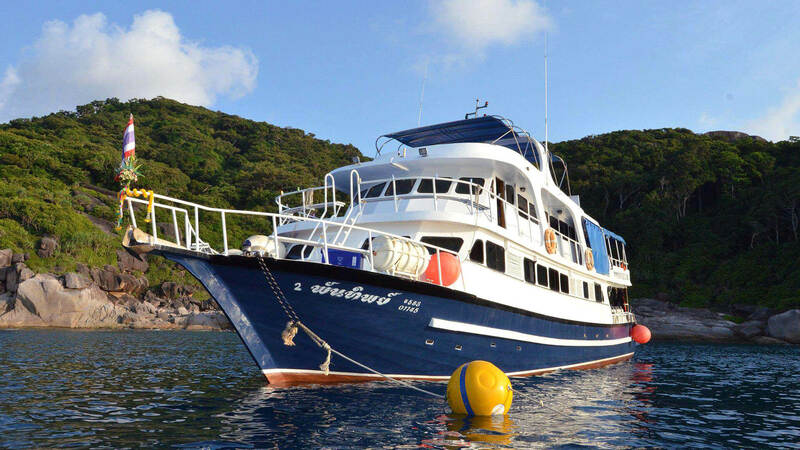 Andaman Tritan is our top recommendation if you are looking for a lower-mid price liveaboard. Andaman Tritan is a slightly smaller boat than many of the liveaboards in the area, taking only 16 guests. A very good option if you want something slightly above the low budget, get an en suite cabin and have less divers on the boat. There are 9 cabins in total – 2 Master cabins with double bed, plus an upper bunk and en suite bathroom, 3 Deluxe cabins – 2 with twin bunks and en suite bathroom, 1 with double bed and ensuite bathroom, and 4 Standard bunk cabins with shared bathroom. The Deluxe and Master cabins are on the main deck, while the Standard cabins are on the upper deck (2) and lower deck (2). The lower deck standard cabins are quite small, but do have the advantage of being single cabins. The highly experienced boat crew and up to 4 dive crew take great pride in exceptional service whilst always maintaining safety. 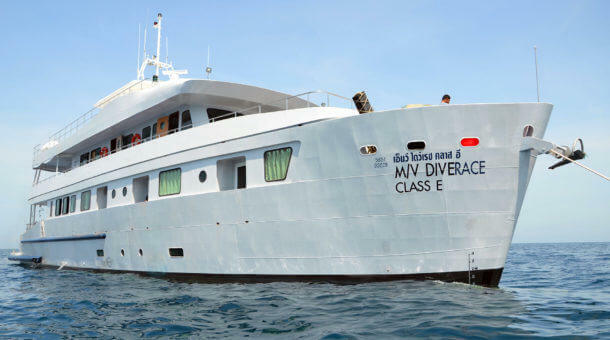 With 9 cabins, an extensive dive deck, lounge equipped with T.V. & DVD, ice maker, air-conditioned throughout with a full compliment of safety equipment, this vessel is a great deal. 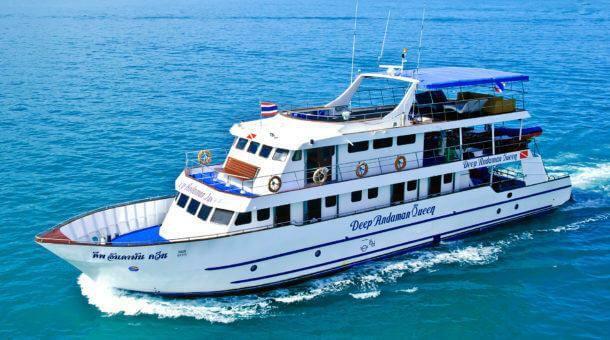 Rental equipment is provided by Sunrise Divers for our divers on the Andaman Tritan liveaboard. Rental price is 500 Baht per day for a set (BCD/regulator/fins/mask/wetsuit) and 250 Baht per day for a dive computer. We have a large equipment room at our dive center with 30 sets of Aqualung BCDs and regulators and a large selection of long and short wetsuits, open heel and full foot fins. Torches for night dives 250 Baht per day. 15 liter tanks available 350 Baht per day. Nitrox is available on board @ 300 Baht per 12 liter tank fill with 1 free for every 6 paid. PADI Advanced Open Water course is 7,900 Baht. PADI Enriched Air (Nitrox) course is 5,900 Baht. Drinking water, coffee, tea are included. Sodas are 40 Baht. Beers are 80 Baht. Andaman Tritan runs trips for 4 nights to the Similan Islands, Koh Bon, Koh Tachai and Richelieu Rock through the season from October to April.